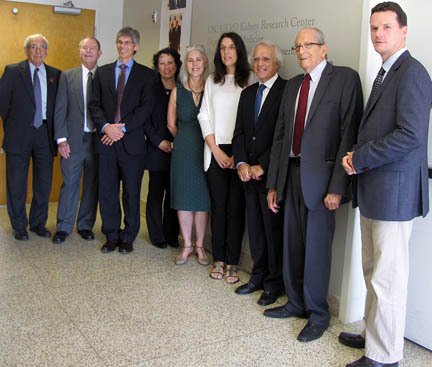 Left to right: Edward Crandall, M.D., Ph.D., Henry David, Kenneth Hallows, M.D., Ph.D., F.A.S.N., Nuria Pastor-Soler, M.D., Ph.D., Alicia McDonough, Ph.D., Laura Perin, Ph.D., Vito Campese, M.D., Ken Kleinberg, Janos Peti-Peterdi, M.D., Ph.D.
On Wednesday, September 2, 2015, USC and UKRO came together to celebrate the opening of the USC/UKRO Kidney Research Center with a fascinating tour of the new research space, comprised of six labs on the fifth and sixth floors of the Mudd Memorial Research Building on the USC Health Sciences Campus. UKRO President Ken Kleinberg and board members Henry David and Ammiel Najar joined Edward Crandall, M.D., Ph.D., Chair of Medicine at Keck, researchers Alicia McDonough, Ph.D., Laura Perin, Ph.D., Janos Peti-Peterdi, M.D., Ph.D. and our hosts Kenneth Hallows, M.D., Ph.D., F.A.S.N., Director of the center and Chief of the Division of Nephrology & Hypertension, the center’s Co-Director and Professor of Medicine, Physiology and Biophysics, Vito Campese, M.D., and Nuria Pastor-Soler, M.D., Ph.D., Faculty Researcher at the center, Associate Professor of Medicine, Division of Nephrology & Hypertension and Assistant Dean for Research Mentoring. We spent an inspiring afternoon discussing the future of research at the center and marveling at the $1 million multiphoton confocal microscope, which will allow the researchers to examine the living kidney in real time. We all believe this marvelous new center will create exciting opportunities for collaboration among the world-class researchers at USC and attract budding investigators from the medical school community. 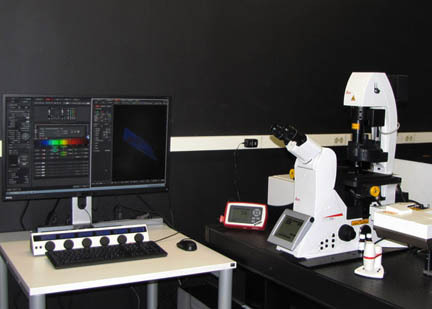 With the multi-photon confocal microscope, researchers can view 3-D images 1000 times larger than they appear to the naked eye. 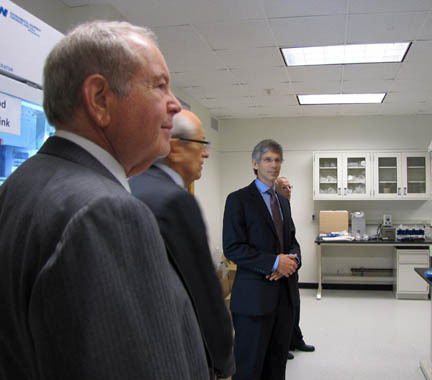 Visit our Facebook page to view more photos from the USC/UKRO Kidney Research Center opening.